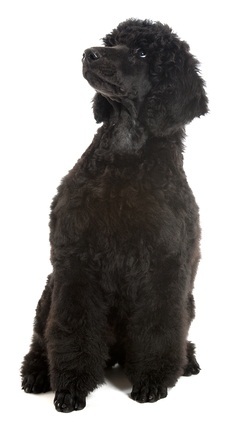 Poodle Dog Personalities - What Dispositions Do They Have? 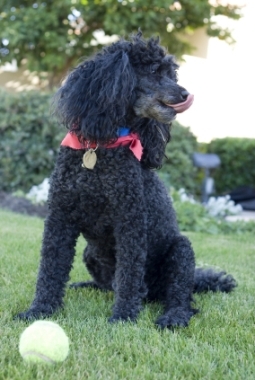 Poodle dog personalities tend to be happy, funny, inquisitive, and sensitive to the owner's moods. They have a very unique and obvious sense of humor. They have a great sense of humor and seem to love their owner's sense of humor, too. When you laugh at their shenanigans, they'll remember and do them again. Holly loved to take her milkbones, which we called cookies, and throw them up in the air. That made us laugh and she knew it! They'd land on the floor and slide across the floor sometimes going underneath the refrigerator. We'd get it out, and she'd throw it in the air again. Some say the standard poodle is a bit more calm and laid back than the toy or miniature. Each dog, no matter what the size, is going to have his own personality so it's hard to categorize each size with its own personality traits. They want to make you happy and please you; they're loving, devoted and loyal dogs. Poodles are also sensitive, almost intuitive at times, and can sense your moods - and your happiness or displeasure with them! When you're tired or sad, they'll know, and will sit on your lap or cuddle on the couch with you hoping to lift your mood. They also have an uncanny ability to distinguish between a ride in the car for ice cream and when they're going to the vet or groomers. Holly always knew when a car ride was ending up at the vet or groomers. How? Probably because she knew the word "doctor" and "clipped" and heard them being used before she had even gotten in the car! Poodles are companion dogs, they need surrounded and loved by their pack. They are not outside dogs. They need to live indoors. They're owner pleasers and want to be around their family. They love to snuggle on the couch or be held in your lap. And give them the attention they feel they deserve! They can seem to be sulking when you don't pay enough attention to them. They can become mischievous just so you will pay them attention! Their dog personalities are not hyperactive. They're even keeled, although they're not low key! They like their owner's love and attention lavished on them. They return that love and affection ten fold. They're also calm dogs, protective dogs, and easy going dogs. They're eager to please, help, and spend time with you. They're not stubborn or bull headed. They're good at assessing situations, perhaps by reading body language. Once they learn something, they remember it, and respond accordingly (pleasingly) in the future. Poodles also crave routine and consistency. They know when certain things should happen and want it to happen the same time every day. If we stayed up a little later than normal, Holly would pace around the living room for a while then head to the bedroom. She'd repeat this until we went to bed! She was tired and knew it was past our, and her, normal bedtime! No two dog personalities are alike. Poodles are fun dogs who will love you unconditionally and make you smile each and every day you are blessed to have them in your home.